Life is a beautiful lie or a truth? Why the race for beauty is on? Beauty is skin-deep or uncouth? Is all this a divine ploy to con? Do you feel life is a beautiful lie? At times, nothing seems real or right? Do you too ask- 'how, what, when, why'? Do life's challenges give you a fright? Or do you believe life is true? And all this is reality cent percent? Is life not a trick or illusion for you? Life's paths are straight & not bent? What about death that's sure to come? 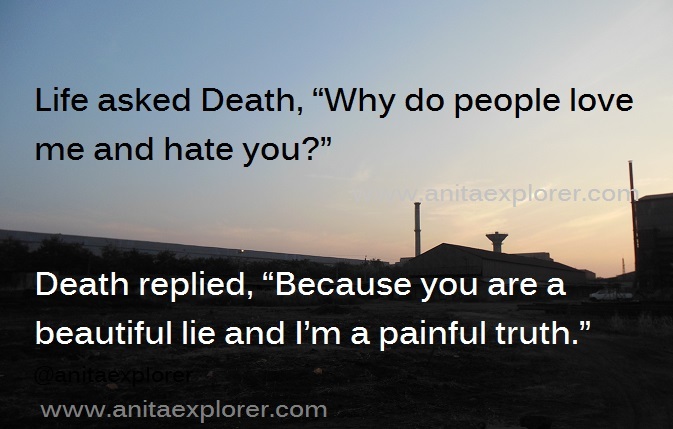 Is death more painful & truer than life is? Isn't death the reality all have to welcome? A beautiful lie's bliss or a painful truth's kiss? 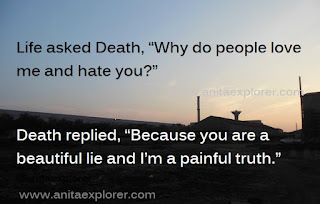 Do you agree that life is a beautiful lie and death is a painful truth? I'm participating in my maiden #atozchallenge. B for Beautiful, Beauty, Believe. Sometimes, I think that life is the beautiful lie and, other times, I think that it is the best reality that could be. Not a lie at all. Other times, life becomes a nightmare. I never know which side of life I will see each day, so it is always exciting and adventurour. So true, Alice! Totally agree. We all are journeying in this life's adventure & encountering lies & realities. Life is everything. A lie, truth, tragedy, nightmare, miracle. Basically, I feel life is a continuous test of our strengths. But death, I feel, is the absolute truth. There is no "may be" in case of death. Life is all this & more! Death is for sure. Interesting philosophical question. I do not know! Life is intense indeed, Abinash. Lets love life, live it full; let's play on life's wavy beach. Life's wavy beach is a great party venue to pick! Death is more real than anything else, I'd say. Death is real. Agree with you, Debbie. What a beautiful poetry, Loving it. Life is a lot of questions, much more then answers... it can be heaven, it can be hell... we just have to do our best to make the most of it, don't we? Very true, Melody. We have to make the most of life. Life is what we make it & how we take it. Life is a mixed bag - you can't escape from anything.